I’ve never been one of those conservatives against (legal) immigration. Call me naive, but I’ve always liked the idea of America being a “melting pot”—at least up until we started paying people NOT to work. But as far as I’m concerned, if you want to come here and join the ever-dwindling number of Americans who still work for a living and pay taxes, I’m all for it. The more the merrier. Maybe that’s because a few generations back, I would’ve been considered an immigrant too. Come to think of it, the same could be said of just about all of us. When my great-great-great grandfather got off the boat from Ireland 150 years ago, he wasn’t coming here for the welfare, or the free education, or the free healthcare. Nope. Great-great-great Grandpa came here to work. That’s why I appreciate the story of the Minorcans of St. Augustine. And those tasty “datil” peppers they brought with them. The Minorcans left their Spanish island of Minorca in the 1760s and came to Florida to also work. Except to get here, they made the mistake of trusting a typical untrustworthy Brit by the name of Andrew Turnbill. The Minorcans agreed to work for Turnbill as indentured servants at his New Smyrna Indigo plantation. However, when their indenture was up, Turnbill refused to grant them release and kept them as slaves, killing almost 1,000 Minorcans in the process. And freedom is exactly what the Minorcans found a few years later when they escaped from the plantation in New Smyrna and arrived 70 miles up the coast to St. Augustine. The natives of St. Augustine – America’s oldest city – welcomed them with open arms because they were skilled and hard workers. That and the fact the Minorcans brought with them that tasty, spicy pepper native to their Mediterranean home. It definitely livened up the locals’ boring English cuisine. You know what they say about the quickest way to a man’s heart? Well, the Minorcan’s datil pepper has been warming the stomachs of native St. Augustinians for over two centuries now. 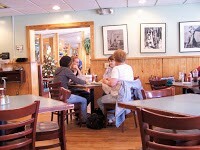 And Barnacle Bill’s is as good a place as any in this historic tourist town to get acquainted with the datil pepper. 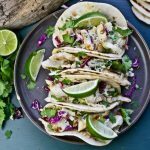 You can order just about anything on their menu with a touch of datil pepper should you desire. 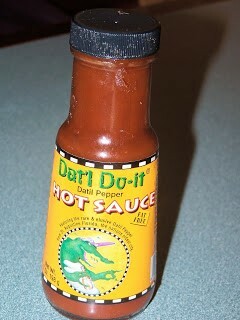 In fact, the restaurant’s owner, Chris Way, has a side business selling his “Dat’l Do-It” hot sauces. I chose to kick off my meal with Barnacle Bill’s Minorcan clam chowder. 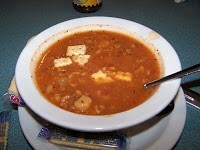 Kin to the tomato-based Manhattan clam chowder, the Minorcan version is full of hearty clams and bites back just enough thanks to its famous local pepper. 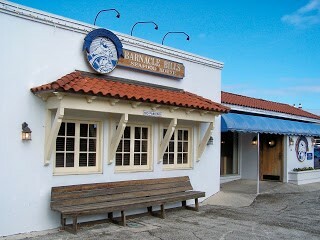 But the real reason the locals fight the tourists to come to Barnacle Bill’s is their fried shrimp. These are big, beautiful, local shrimp fresh out of the Atlantic. Breaded and fried, those babies were crispy and succulent. I ordered mine sprinkled with datil pepper powder, adding that extra zing. Best of all, it came with a creamy datil pepper dipping sauce. It was the perfect complement to my fried shrimp. But I found it to be a real dilemma. The shrimp were delicious on their own. But the dipping sauce was downright addictive. So I alternated. One shrimp dipped. One unadorned. One dipped. Over and over. Until they were all gone. But, don’t worry. It’s not like I left hungry. 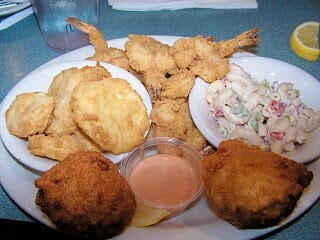 The fried shrimp platter came with a cool, creamy macaroni salad with diced celery and red peppers. And two perfectly fried hush puppies. And a whole mess of tender, fried squash. In the South, everything gets fried – especially vegetables. As a general rule, if you’re at a really good fried seafood place, you can’t go wrong with fried veggies too. And yes, Barnacle Bill’s does offer a full bar as well. But for the most part, people come here to eat, not drink. Yeah, the seafood is that good! This is a casual, family-friendly place where the sunburned tourists and the locals who just got out of church can both come and feel right at home on a balmy Sunday afternoon. 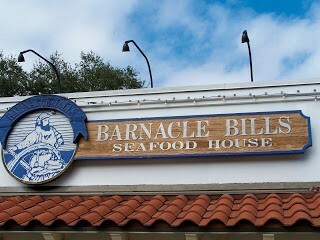 Now that I think about it, Barnacle Bill’s is kind of like a melting pot. A melting pot with really good eats. Rating: Seriously Thought About Buying Shirt.